Art therapist Brian Berlinski (pictured) works at DeafHope, an Oakland-based nonprofit that provides counseling, education and services for deaf survivors of domestic and sexual violence. Berlinski, 30, grew up in New Jersey and at 2 became deaf after contracting meningitis. Hearing aids restored 70 percent of his hearing, and from age 10 he went to classes with an American Sign Language interpreter. 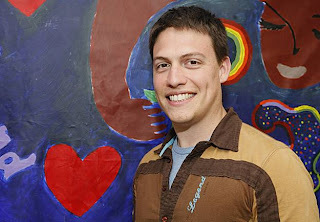 He has a bachelor of arts degree from Rochester Institute of Technology and a master's in art therapy from Nazareth College in Rochester, N.Y. He lives in Emeryville with his partner of two years, Michael Berry. Berlinski spoke through ASL interpreter Shelley Lawrence. It's still very taboo to talk about domestic and sexual violence in the deaf community. It's not unlike the hearing community. But I think deaf people, due to language and system barriers, have less access to the right information - especially about dating and health care. At DeafHope it's our job to cut down on the stigmatization and provide materials and information in American Sign Language. I work with children who are survivors of sexual assault. Sometimes with deaf children, sometimes with children who are hearing but their parents may be deaf. The mother might be a survivor, so I work with the kids; I help them process the abusive experience. Art therapy fits a deaf survivor because it's very visual and helps the survivor to connect with the unconscious part of the brain. That's where the trauma is stored. Art therapy takes them through that experience again and provides a safe way to bring it to consciousness - without their being overwhelmed by the trauma again. We work with masks a lot. Children often feel like they can't express themselves because of the abuse in the family, and they keep it inside. So they draw a mask of what they're afraid to project outside of that environment, which provides a safe outlet for identifying and expressing painful emotions. You can't lie through art. The therapist looks to see where the emphasis is put by the child - where they add more detail or a different color. And that gives us valuable information about what's going on with that person. There's no hard data on the prevalence of domestic violence in the deaf community, but based on anecdotal proof, the numbers are about the same as in the hearing community. What's different is that deaf survivors have more barriers to getting help, and less opportunity to escape or flee because of those barriers. This work can be emotionally exhausting. Every day we remind ourselves about the importance of self-care. With survivors we're preaching self-care, and if we don't follow our own advice, that's contradictory. So we learn how to not bring work home. I've worked in other places where I was the lone deaf person and I struggled with communication barriers. It was hard to make a personal connection, to feel involved with what people were saying and the latest news. And here, I'm not worried about that. It's such a comfortable environment. I've not worn my hearing aid in almost four years - since I moved to California and started working here. I leave it at home because I don't need it. When I want to listen to music, I make that exception. I have an iPod. Or, if I go see a movie, I use my hearing aid. I really appreciate life without sound, and I take great joy in my identity as a deaf person. There's so much noise out there, between the yelling and the horns and the phones and the TV blaring and the bar noise. And deaf people - we just talk to one another visually and without effort. We need light; that's the one requirement.